Premiere Pro is a powerful, timeline-based video editing software, and this personal training course uses a full-color book plus video tutorials on DVD to teach you how to use all its features. Fifteen self-paced lessons encourage you to discover the creative possibilities that Adobe’ s Premiere Pro presents. Step-by-step directions, lesson files, and an instructional video demonstrate the many exciting features of Premiere Pro. You can learn from leading instructors, and do it at your own pace. Premiere Pro Digital Classroom is like having your own personal instructor to teach you Premiere Pro right in your own home or office. The Adobe Creative Suite 5.5 Production Premium for Windows is a collection of applications that includes Adobe Premiere Pro, After Effects, Photoshop CS5 Extended, Adobe Audition, Flash Catalyst, Flash Professional, Illustrator, Adobe OnLocation, Encore, Device Central, Bridge and Media Encoder. It also integrates with CS Live online services. Delivering better efficiency and speeding up your video production workflow, the Creative Suite 5.5 Production Premium provides native 64-bit operating system support that allows you to utilize all the RAM on your system and work fluidly on HD and higher resolution projects. The Mercury Playback Engine in Premiere Pro can offer astounding performance with or without GPU acceleration, on both desktops and laptops (Windows). The GPU-accelerated features in Photoshop Extended accelerate image cropping, color picking and brush treatments.Formats such as DV, HDV, RED, DPX, Sony XDCAM, XDCAM 50, XDCAM EX and XDCAM HD, Panasonic P2, DVCPRO HD, AVCHD, AVC-Intra and footage from DSLR cameras can be edited as it offers a broad format support in Adobe Premiere Pro. You can also swiftly transcode or rewrap media. Intermediate rendering is eliminated, as it features deep integration, roundtrip editing and Dynamic Link and you can refine assets between After Effects, Premiere Pro and Encore. The Roto Brush in After Effects enables you to separate moving foreground elements from their backgrounds in fewer steps. Dual-system sound. Vegas Movie Studio HD Platinum 11 Production Suite takes HD video and audio production to the next level with additional tools for professional-level sound design and more video effects and transitions. Use the included Sound Forge Audio Studio software for precise audio editing; then enhance your multimedia projects with 400 exclusive music soundtracks. Quickly learn essentials with the included tutorial DVD. The Adobe Video Collection delivers the power to create impressive, professional digital video and images! Transform simple video into award-winning productions, with its incredible digital video editing and interactive authoring tools. Get amazing results every time - for film, video, DVD, or the Web. Adobe Premiere Pro CS6 software is the industry-leading cross-platform video editing software. Edit low-resolution to 5K and higher resolution footage with greater speed and precision without transcoding. Get stunning 64-bit performance, highly intuitive workflows, enabled for timesaving Adobe integration, and project exchange with Final Cut Pro and Avid NLE software. Stabilize footage with the innovative Warp Stabilizer, easily create and edit multicam sequences, adjust effects in real time during playback, and quickly encode finished video for virtually any screen. Sleek, highly intuitive, and customizable user interface-View more of your media with redesigned monitor panels, customizable button bars, and full-screen mode option. Fluid editing workflow-Take advantage of the most requested editing enhancements, including over 50 enhancements to smooth the transition for those switching from another NLE. Dynamic timeline trimming-Finesse your editing with precision using powerful trimming tools. Trim clips your way-directly in the timeline via keyboard entry or dynamically in the Program Monitor using JKL shortcuts. Warp Stabilizer effect--Easily stabilize a bumpy camera move or lock a shot automatically with the same powerful technology as in After Effects software. Powerful multicam editing-Quickly and easily edit multicam footage from as many cameras as you have on the shoot. View each track?s audio waveform, sync via time code, switch between tracks in real time, and adjust color across multiple shots. Those creative professionals seeking the fastest, easiest, most comprehensive way to learn Adobe Premiere Pro CS5 choose Adobe Premiere Pro CS5 Classroom in a Book from the Adobe Creative Team at Adobe Press. The 22 project-based lessons in this book show readers step-by-step the key techniques for working in Premiere Pro CS5. Readers learn the basics on things like using audio, creating transitions, producing titles, and adding effects. Once they have the basics down, they'll learn how to take their projects further by sweetening and mixing sound, compositing the footage, adjusting color, authoring DVDs, and much more. This completely revised CS5 edition covers new features such as Ultra, the new high-performance keyer. New workflows for creative collaboration are also explored, from the script all the way to the screen using Adobe Story, OnLocation, Speech Search, and other Adobe tools that are right at users' fingertips. Best of all, the companion DVD includes lesson files so readers can work step-by-step along with the book. 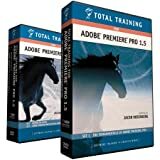 Total Training Tutorial DVD Set for Adobe Premiere Pro 1.5 Software.